Unlike many of the emperors of this time period Valerian was of a well established senatorial family. 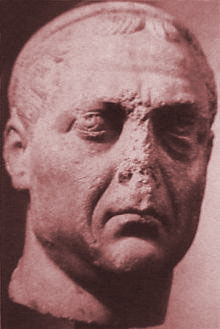 Though very little is known of his early life and career, it can be assumed that he served the Roman state dutifully since by his first mentions in historical record in 238 he was already an ex-consul of good reputation serving under the emperor Decius and his successor Trebonianus Gallus. He was married to Egnatia Mariniana and had two sons, Gallienus and Valerian Junior and by 253 Valerians ability as a military commander must have been more than adequate for It was in this year that the usurper Aemilianus revolted and Valerian was chosen by Trebonianus Gallus to put down this rebellion. Before he arrived, the unfortunate Gallus was killed by his own men who joined Aemilianus in revolt before Valerians arrival. Upon hearing of the emperors death Valerians troops proclaimed him emperor and they continued on towards Rome where, upon their arrival, Aemilianus's troops deserted and killed him joining Valerian who was quickly accepted as the new emperor by a senate pleased to see one of their own raised to imperial power. He took control of an empire in crisis and turmoil. Recognizing the need for decisive action and realizing the dangers that threatened the empire in both the East by the Persians and the West by Germanic tribes he set a precedence by splitting the empire, raising his son Gallienus as his college in charge of the West while he turned his full attention to the east. 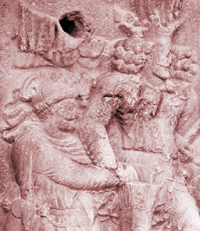 With his son charged with bringing stability to the west, Valerian moved eastward to challenge King Shapur who had occupied much of Syria and Armenia. Valerian seems to have met with some success and by 257 he had recovered Antioch and returned the province of Syria to Roman control. His luck would not hold and what would follow would be considered by many to be one of the most devastating and humiliating episodes in Roman history. In 258 he faced an unexpected invasion by Goths who flooded into Asia Minor. After taking decisive measure to protect that region he then moved to Antioch to protect that territory against the Persians who were mounting a new offensive. In 259 Valerian moved to the city of Edessa and engaged the forces of King Shapur where he suffered defeat, possibly due to the fact that a significant number of his soldiers were lost to an outbreak of the plague. 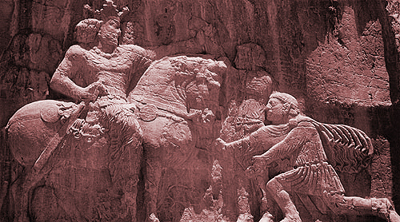 Valerian was forced to negotiate a peace with the Persian king who instead took him and a contingent of his men captive. Valerian would be the first and only emperor to be taken captive but the humiliation would not end there. Although Valerian is reported to have offered a large sum for his own freedom, the Persian king chose instead to keep him as his prisoner. What happened to the Emperor while a captive of the Persian King is debatable and most accounts are less than reliable. Some modern scholars believe Valerian was possibly allowed to live in relative comfort and his men were possibly used as labor in various building projects while an early contemporary Christian source tells a very different story. The Christian author Lactantius, a native of North Africa, writes that Valerian was demeaned and humiliated by the Persian King being used as a human step ladder when the king wished to mount his horse and was eventually killed by having molten gold poured down his throat. Once dead the King is reported to have had the emperor skinned and stuffed with straw as a lasting trophy of his humiliation and defeat of a Roman Ruler. Although early in his reign Valerian had treated the Christians relatively fairly, some time later in his reign he had enacted unfavorable policies that resulted in a renewed persecution of the Christians and this gruesome tale may have been a way to show the fate of one who would go against the church. Regardless of the specific details regarding his treatment at the hands of the Persians, Valerian would never return and would die in captivity leaving his son Gallienus the sole ruler of an empire in crisis and decline. Although Gallienus was aware that his father was taken alive, he was in a precarious position and lacked the power to free him from the Persians who were running amok after their triumph. Only after a rally by a his forces in the east when a semblance of order and control was reestablished did he announce to the people that his father was dead (in fact it is not known if Valerian was dead by this time). Gallienus would rule as the sole emperor for 8 more years until his own death, most likely at the hands of his praetorian guard and the future emperors Claudius II and Aurelian.